_The Kurio is the new kids tablet on the block, aiming to take on the big boys with a winning combination of games and entertainment for the kids, and educational content to keep parents happy too! Let's face it, most kids really want an iPad or a smart phone, so their tablet has to offer what they do; apps, and lots of them. 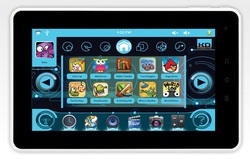 Since the Kurio is Android-based, there are plenty to choose from, and the Kurio also comes with top game apps pre-installed including World of Goo, Fruit Ninja, Angry Birds and the excellent Cut the Rope. Hundreds more are available at the Kurio Store, along with learning and educational games. 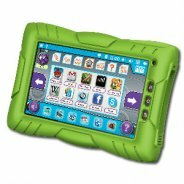 Like most tablets, kids can view videos in stunning HD quality either on their Kurio or through a tv, and play music in a variety of file formats. When it comes to taking pictures, the Kurio has an extra trick up its sleeve with both front and back cameras, plus video capability too. _The Kurio is also built for life with the kids, and comes with a protective drop-safe 'bumper' casing that protects it from the inevitable if unintended free falls to the floor. If they want to personalise it more, designers are already creating fun 'skins' and cases featuring favourite characters from Peppa Pig to the Bin Weevils. Since the Kurio is Wi-fi and web enabled, parental controls are crucial to protect your youngsters when browsing online. As a parent, you can define what kind of Internet content your kids look at, which apps they can access, if you only want them to look at a safe list of websites, and which ones you definitely want to block them out of. If you want kids to share their Kurio, you can set up different user accounts so they only see what you want them to see. InspirationWorks may be new to the kdis tablet scene, but the buld and features of the new Kurio shows they certainly mean business.